The field for our 2017 Air Shot of the Year has been halved, with nary an upset to the bracket. Indeed, only Gregg Barsby managed an opening round surprise, coming from the fourth seed with his Vibram Open tunnel shot to knock off a miraculous, but less loved scramble from Ricky Wysocki at the Jonesboro Open. Looking at the quarterfinals, then, we find that Simon Lizotte and Paul McBeth are in the driver’s seat, as both have two opportunities to make it to the semis. Are we destined for a final round showdown between a pair of disc golf titans, or can an upstart make a move? As always, much appreciation to Jomez Productions, Central Coast Disc Golf, The SpinTV, SmashboxxTV, and Disc Golf Examiner for capturing these clips. Dial in those votes, and come back for more on Wednesday! But can Jessica Weese somehow surprise with this tee shot that nearly cashed at the Jonesboro Open? 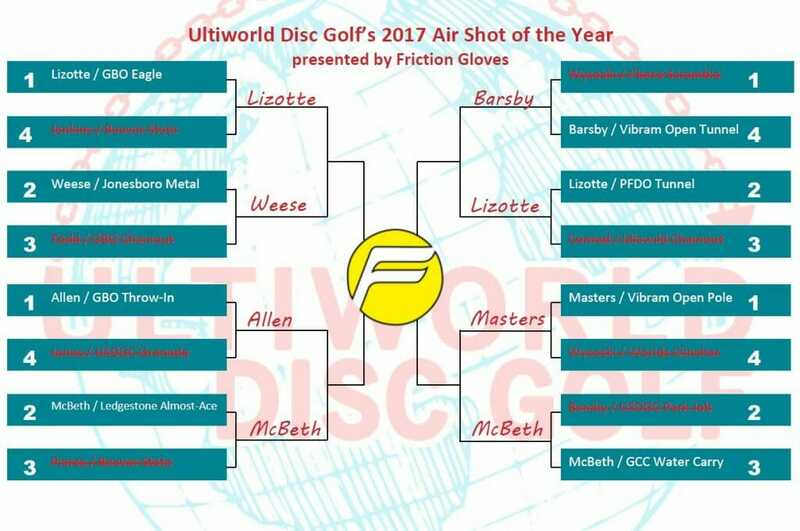 Comments on "2017 Air Shot Of The Year Presented By Friction Gloves: Quarterfinals"